Of the 206 bones in one’s body, 52 comprise the feet. While this may seem insignificant to most, the feet functioning properly are vital to one’s overall health and well-being. 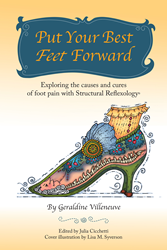 With her new book, reflexology expert Geraldine Villeneuve hopes to spread awareness to the impact poor foot function can have on one’s body. “Put Your Best Feet Forward” shares valuable knowledge pertaining to foot function and how it relates to the overall movement of the body. Villeneuve has presented in-depth knowledge about foot function in layman’s terms in hopes of the common man understanding the importance of one’s foot. While learning about the importance of taking care of one’s feet, Villeneuve also sheds light on potential warning signs of declining foot health. Villeneuve has been studying foot reflexology for more than 30 years. She earned her bachelor of science in therapeutic recreation from Lyndon State College in Vermont. She also carries a masters of reflexology certification from Feet First, a reflexology training facility in New York. Villeneuve has been a keynote speaker in many health-related forums including reflexology, chiropractic care and has spoken to the University of Vermont medical students.